Page Saver Book. 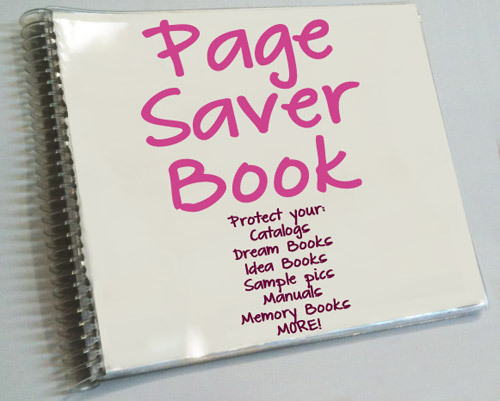 Present a professional image with the Page Savers book! Vinyl pages measure approx 7.25 inches wide x 6 inches tall. Water-proof, tear-proof vinyl page protector books will protect your paper pages. 12 spiral bound page protectors keep your literature in perfect shape and will hold 24 front and back pages in the 12 vinyl page holders. Use one for your current catalog, and a second one for the issue before. You can use a dry erase marker on the pages to circle sale items or to remember products for certain customers. 5x7 photos will fit in here for a photo album or brag book! SAVE!! Buy 3 for $30.00!! I find this to be very useful - with my copy incased in cover I can hold it up or pass it around or just hand it to someone without having to worry about it getting wet or having a used look.